The vote of thanks is a tricky speech to make. You might imagine that a type of speaking which has its purpose in its title – the vote of thanks­ – would be an easy job to do. For starters, it is meant to be short. The longer you go on, the more the speech becomes about you rather than the subject of your toast. Think three minutes at maximum – make the necessary introductions, get to the heart of why the person deserves praise, and then encourage applause. Don’t waffle. Three minutes, though, isn’t terribly long and squeezing everything in needs careful structure and planning. Don’t rush. 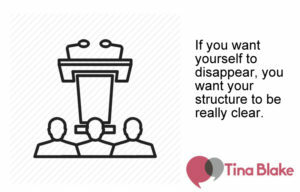 Speaking really quickly is the surest way to lose an audience. Instead, write your remarks carefully. Include only what is necessary, and be concise. Shakespeare wrote that “brevity is the soul of wit” for a reason – keep it short, and people will smile! One great way of keeping things brief is to remove yourself from the speech. This is essential in a vote of thanks – you’re not the main event, the person being thanked is. So focus on the deserving subject of your speech, not on your own observations or funny stories. Get out of the way and show your gratitude by being a bit selfless. In between, focus on a few carefully selected points: refer to Amy’s work, or the speech she has just given, with a few judicious examples that cast into high relief just what a great person she is. Keep your points distinct and as straight-forward as possible. Again, the focus should be on thanks. So: keep things short, be concise, get out of the way and stick to your structure. If you do that, everyone will be applauding the recipient of your thanks at exactly the right moment – as soon as you sit down! Follow these rules of thumb and you’ll be getting lots of gratitude yourself.